The red warning covered parts of Devon, Somerset and south Wales and prompted Devon and Cornwall police to declare a major incident. It was only the third such warning the Met Office has issued since the current system came into force in 2011. The red warning means: “Widespread damage, travel and power disruption and risk to life is likely”. 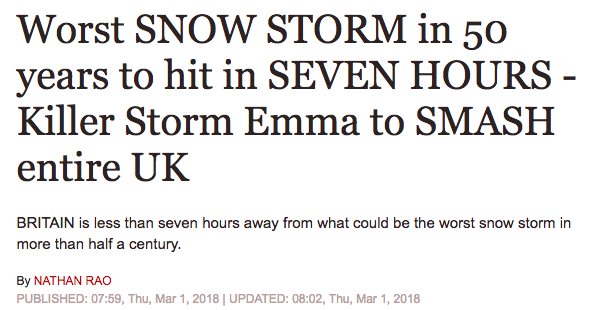 Storm Emma, named by the Portuguese weather service, pushed up from the south bringing heavy snow and gusts of more than 60mph. People are stranded on the roads and are abandoning their cards. A drive that usually takes Andrew a half hour took him two hours. He almost abandoned the car as he was within walking distance to home. He helped push several cars up hills and had to have someone push our car. The weather is costing the UK millions. The AA estimated that there were 8,260 collisions on Britain’s roads from the snow chaos in just three days, with the insurance cost already above £10m. Havoc aside, everyone is enjoying playing in the snow, including Team Great Britian’s Billy Morgan, just back from Pyeongchang with a Winter Olympics bronze medal, who took to the streets of Essex to perform tricks and spins. Andrew I were both scheduled to take our driving tests so we can get our UK license but the tests have been cancelled. Time to snuggle in for a long winter’s nap. Luckily Andrew can work from home!